I have been a very good girl lately and have really cut back on my discretionary smelly-spending. But I refused to pass up this new autumn collection from Solstice Scents. I was so excited about the Manor Collection last year and was even more excited to see that Angela has further developed her mythical Manor and expanded the concept into a whole town, inspired by the Foxcroft fragrance. There are so many places to explore in this cozy little hamlet, and if the detailed, hand-made map included in my order is any indication, we may be visiting more locations in future collections! I got a sampler of all six locations in the collection, and also received a wonderful mini town newsletter highlighting all the current events-I was interested to learn that the Manor was unfortunately destroyed in a fire. And look at this map, made by Greg! It reminds me a little of the maps from Lord of the Rings. Really beautiful, imaginative work! I was positive that this would be the hands-down winner of the bunch, but at first I was really conflicted about it. My skin seemed to amping the cedar for the first few days I had it to where it smelled mostly like sweet pencil shavings on me. It was really weird! But as I've kept using it it's really improved and has indeed come to the forefront of my favorites. It's not a straight-pancakes and syrup scent, though when I've worn it to work I've heard people say "Who's got pancakes?" and "I smell caramel." I can definitely smell the chai element, the cardamom and other spices, and a woodsmoke that's smoother and less pervasive than Smoky Mountain Mallow. It's a perfectly cozy, slightly foodie but mostly woodsy/resinous autumnal scent. I'm being quite ruthless in what I will consider full size worthy, and this one makes the cut. I don't have anything quite like it. I love Wail of the Banshee soap, and this scent does remind me of it. Very earthy, leafy, and woodsy. Coniferous, but not too sharp. Leans more traditionally masculine cologne-y especially when it dries down, but still generally unisex, I think. I like this but I feel like I must have other scents that are at least similar, so I will pass on a full size. I really like this one! Very sweet and foodie. Fruity at first, especially banana, but that quickly dissipates into a baked, boozy, creamy, delicious mound of yum. It clings rather close to my skin though, I wish it wafted a bit more. This is a scent I want to share! Part of me would like a full size of this. I think it would have to be in a glace though, since those typically have extra oomph in the sillage department, but I don't really use glaces much during the winter. Ah, decisions, decisions. Now, this one took me by surprise! It sounded like such a quirky, throw-away novelty scent. But I love when this happens, I get an awesome scent memory from this one! It's supposed to be an autumn scent that brings to mind the experience of watching a drive-in movie-the root beer, the popcorn, the candy, the cool night air and distant woodsmoke. A seemingly discordant mish-mash of scents that seemed, to me, to have disaster written all over it. But, no, I love this! And it truly qualifies as a totally unique scent-I have never smelled anything like it. It's got a lot of foodie notes, but I don't think I'd classify it as a primarily foodie scent. It's quite the trip and a full size for sure! I suspect this may be a divisively conceptual scent-you either love it or hate it. I can see how it might confuse or weird people out-it's very much everything in the scent description, but somehow, it all works together. I get a burst of root beer at first, sort of sweet and effervescent but also a bit birch woodsy, a touch of salty popcorn and creamy chocolate, laced with whispers of leather and smoke. All of these elements converge for me into a totally different image though, and it's oddly enough a great childhood Christmas memory. In my neck of the woods in Ohio there's this great holiday attraction that I started visiting as a young child -Clifton Mill. It's legendary for its holiday light display and I'm pretty sure it's won some sort of award for it. The mill is set by Clifton Gorge, and every year the entire gorge is filled with twinkling streams of red and white light, mimicking moving water. They have a light display choreographed to either Manheim Steamroller or Trans-Siberian Orchestra Christmas music, I can't remember which, but it's really fun to watch. They have a Santa's workshop too-you can peer through the windows and watch Santa at work, and every so often he literally goes up the chimney and comes out on the roof, waving at all the kiddies (and yeah, the kids at heart too.) 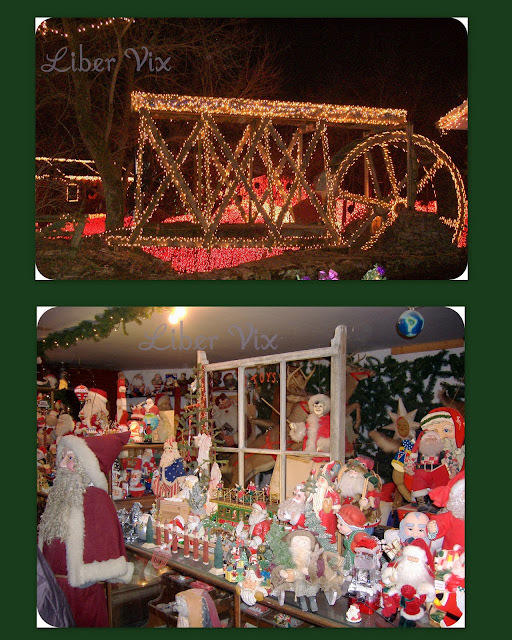 There's even a life-size sleigh and mechanical reindeer on the roof! At the Mill they serve hot chocolate and popcorn, and that's what first made me start associating it with Maine Moon, that smell of walking around in the chilly dark, illuminated by a gazillion lights, munching on popcorn and warming our hands around steaming cups of cocoa. They also have this expansive, animated miniature village, complete with model planes flying by on wires, players moving around the field at a football game, and a recreation of the house from A Christmas Story. If you look closely at the picture below, you can just make out the infamous leg lamp! A funny coincidence is that the miniature town has a drive-in movie theater (named the Blue Moon!) too, with actual footage playing on the tiny screen. Another couple shots of the mill- G and I went there together in 2011 and for the first time since I was really young, we waited in the incredibly long line to get into the Santa museum, which has an amazing array of vintage Santa figures, toys, statues, anything you could imagine. All are fascinating, some are sort of creepy. Like the "teacher Santa" in the picture below, I hadn't seen it for years and years but as soon as we entered the museum I remembered vividly how much it had always creeped me out! He's mechanical and looks back and forth with that evil Santa grin, turns the pages of his book, and raps against the glass with his pointer to get your attention. Oh god. Shudder. Moving on from memory-land, this is the only scent in the collection that really didn't do anything for me. It smells mostly like banana pudding at first, with a little vanilla, and dries down to a generalized sweet smell. It's not bad, but I found it a little one-dimensional. I don't need anymore than a sample of this one. One of the few happy memories of church I have is the regal, exotic scent of burning incense, the reverential silences, mysterious dark corners and ancient-looking statues of my childhood church. This scent does a wonderful job of recreating those memories for me. This one reminds me of a mixture of Night Star, Basilica, and Conjure, all rolled into one. I think it's less obviously Christmas-y than Night Star and lacks the slight tang of citrus that makes Night Star a little iffy on me at times. If you don't care for patchouli-which Night Star has a lot of, you might gravitate towards this one. It also has the year-round wearability and woodsy smoothness of Conjure. I would ideally like a full size of this, but I think Maplewood Inn and Maine Moon will probably come first. All in all, a really successful and inventive collection. I can't wait to see if we visit Foxcroft again with the Winter 2013 release! That's so awesome that Maine Moon ended up being a scent you liked and even gave you a wonderful scent memory! Thanks for sharing the memory with us! 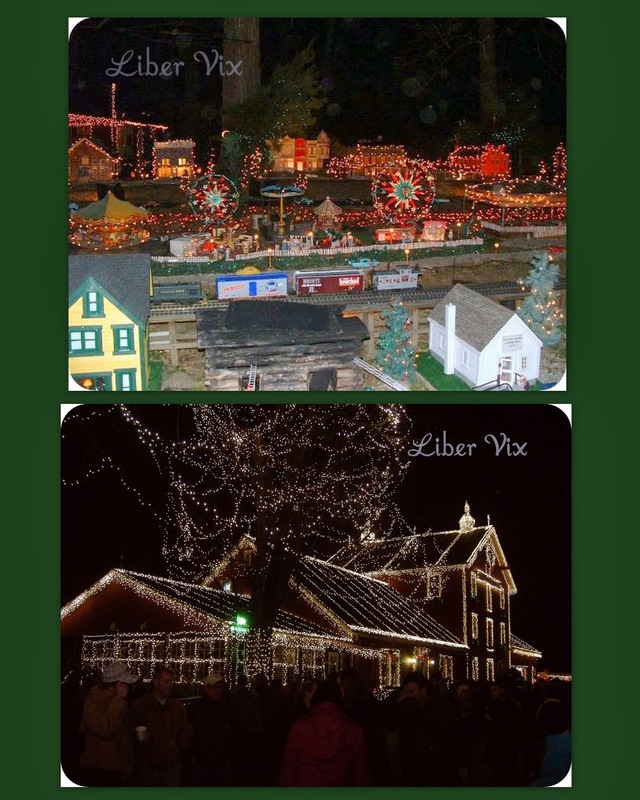 Clifton Mill during Christmastime looks absolutely delightful! I adore Christmas lights and it looks (and sounds) like a wonderful little adventure! Except for the teacher Santa in the Santa museum... *shudder*. Hopefully I look nothing like that at work, haha! Again, thanks for sharing your thoughts, and I hope you have a wonderful Thanksgiving! Thank you for reading doll! Hope you have a great Thanksgiving too!